Your wellbeing is very important to us and it’s part of our vision statement to make sure all our students have the skills to lead happy and successful lives. We get that at times, you don’t always feel your best. Homework, friends and life outside of school can have a big effect on how you’re feeling, but we just want you to know that we are always here to help. 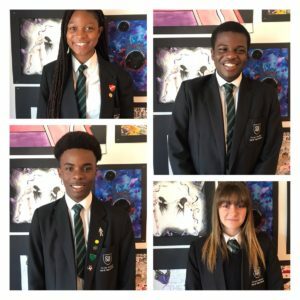 Each Year group has an Associate Head of Year and a Head of Year and each student has a form tutor, these are all people you can go to to talk. There are also other people (see signs around the Academy) who you can go to. In 2014, we introduced mindfulness to our staff, with some students also having taster sessions. We are continuing to look at how we can use mindfulness as a tool to promote wellbeing within the Academy. If you are a parent or carer wishing to talk about your child, then please do contact your child’s Associate Head of Year, or Head of Year. We always encourage students to come to us with their problems, but we understand that sometimes you might not want to speak to us about things, which is why you can find lots of other places to find help below. At Coop Academy North Manchester we promote the benefits of having positive mental health. The academy is fortunate to have a number of staff trained in Mental Health First Aid as well as our own Mental Health Ambassadors, School Nurse and counsellors. Promoting good mental health for all our students increases their emotional well-being and has a positive impact on student’s daily life in and out of school. Therefore if you child is suffering from anxiety or is finding it difficult to express themselves this may be a sign that they do need some support. There are many practical tips that parents can take to support their child which include listening to what your child is saying, taking time out to enjoy activities, playing sports or listening to music. The academy also has links with several Mental Health groups who visit school on a regular basis to talk about and inform students about Mental Health. If you are concerned about your child then please do not hesitate to get in contact with the Academy and we will be able to offer you advice. Young Minds is the UK’s only national charity committed to improving the mental health and emotional well-being of all children and young people. Or any other health matter that is worrying you. You have the same right to privacy and confidentiality as any adult. Our School Nurse follows a professional code of practice, this means your conversations will not be shared with anyone else unless you are at risk of harm; and even then they will discuss it with you first. Speaking to our School Nurse is a safe space. Our School Nurse is in the Academy every Tuesday and Friday, but you can also ring the school health team on 0161 241 2813.